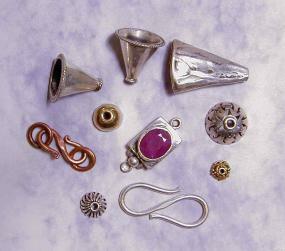 Rio Grande, 800-545-6566: This is one of the best suppliers for jewelry making. You can call and they'll send you their catalogues covering everything from supplies and equipment to gems, findings, display and packaging. Hauser Miller, www.hauserandmiller.com, 800-462-7447: This is a refinery for precious metals where you can buy wire as well as return left over metal for credit. Wire Sculpture by Elizabeth Berrien: www.wirelady.com. An internationally known wire sculptress, Elizabeth Berrien writes and draws in wire to create large scale wire sculptures. Woven Wire Studio is Lisa Van Herik's gallery website where you can view my exhibit wire jewelry pieces.